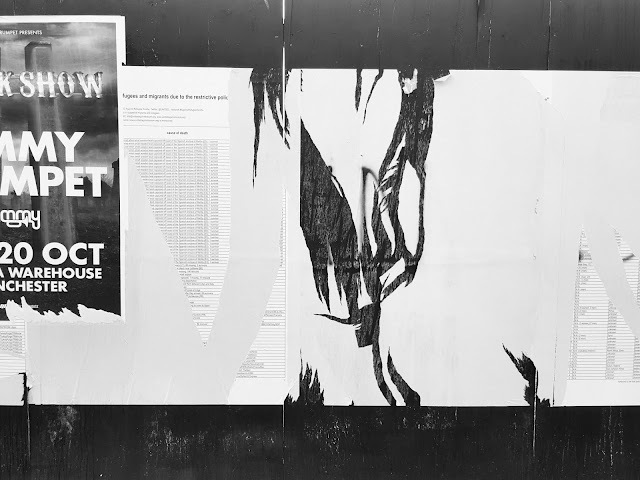 Banu Cennetoğlu's "The List" in Great George Street. 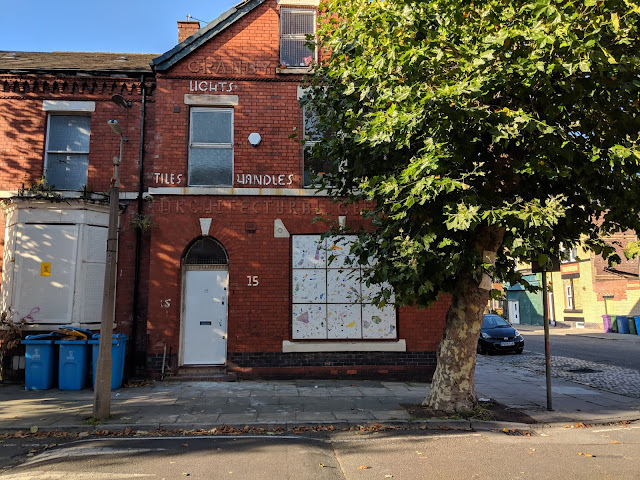 The Liverpool Biennial 2018: Beautiful world, where are you? 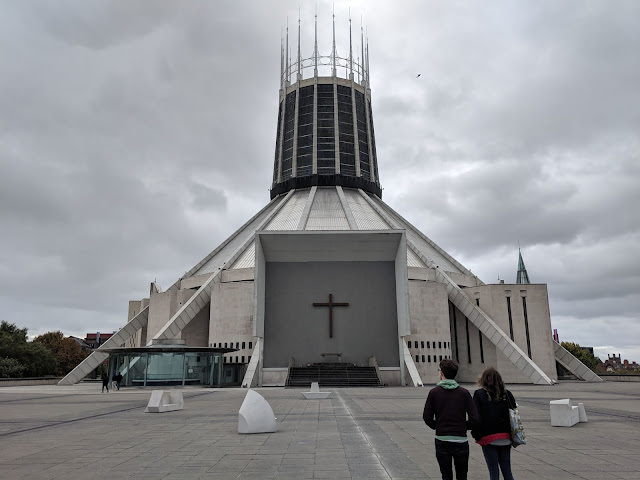 (14 July – 28 October 2018) presented the work of over 40 artists in locations across Liverpool including public spaces, civic buildings and the city’s leading art venues: Blackburne House, Bluecoat, FACT, Open Eye Gallery, Liverpool John Moores University’s Exhibition Research Lab, Liverpool Metropolitan Cathedral, the Oratory, the Playhouse theatre, RIBA North – National Architecture Centre, St George’s Hall, Tate Liverpool, Victoria Gallery & Museum (University of Liverpool), public spaces and online. 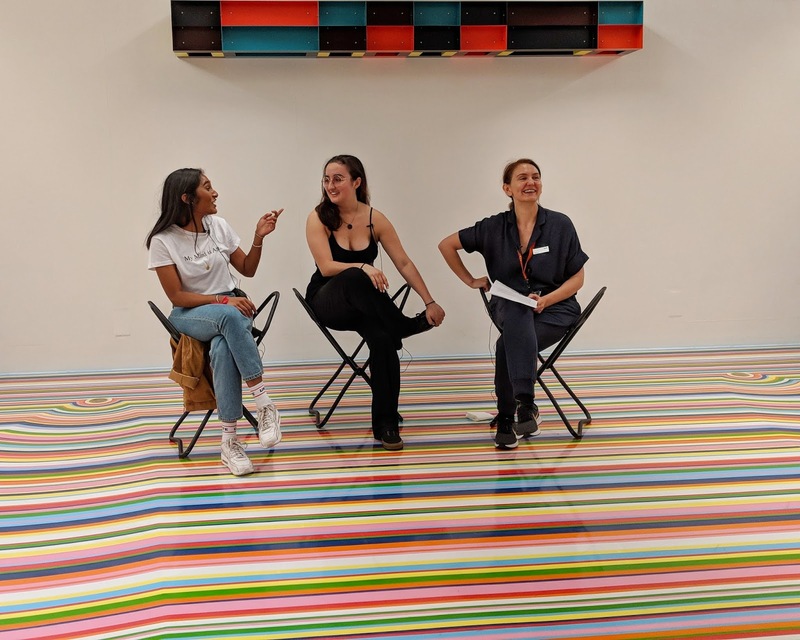 The 2018 edition was curated by Kitty Scott (Carol and Morton Rapp Curator, Modern and Contemporary Art at the Art Gallery of Ontario) and Sally Tallant (Director, Liverpool Biennial) with the Liverpool Biennial team. 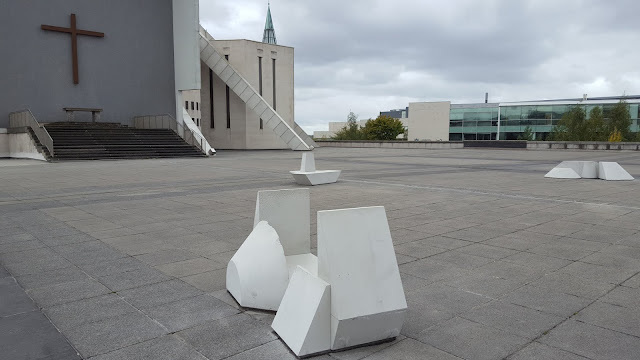 The following texts are from the Liverpool Biennial website. All photos by Latitudes. Above and below. 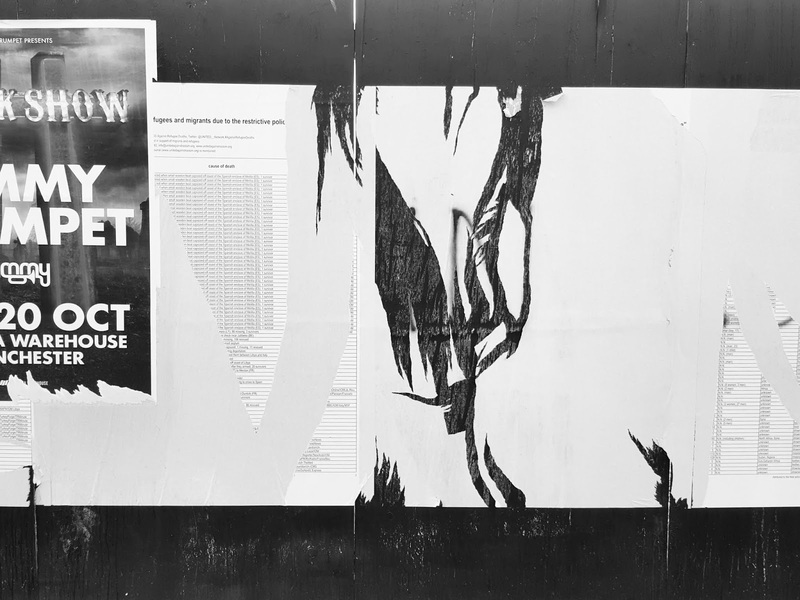 Banu Cennetoğlu's "The List" on a 280-metre hoarding on Liverpool's Great George Street. 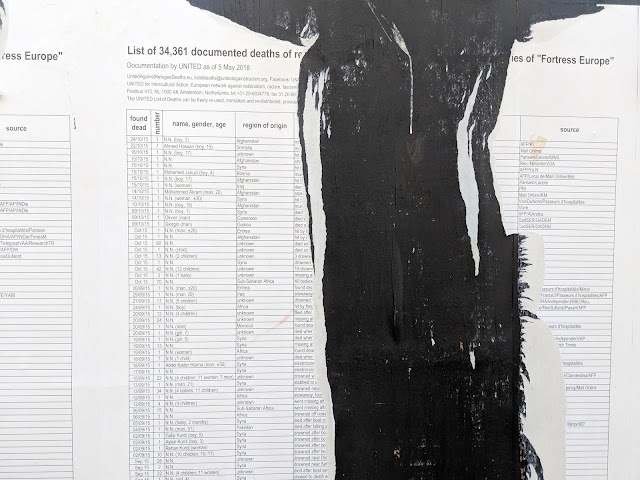 Compiled and updated each year by UNITED for Intercultural Action, an anti-discrimination network of 550 organisations in 48 countries, "The List" traces information relating to the deaths of more than 34,000 refugees and migrants who have lost their lives within, or on the borders of Europe since 1993. 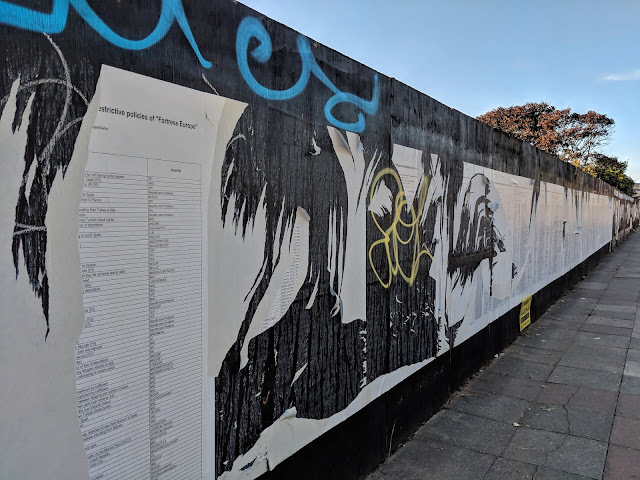 Since 2007, in collaboration with art workers and institutions, Banu Cennetoğlu has facilitated up-to-date and translated versions of "The List" using public spaces such as billboards, transport networks, and newspapers. 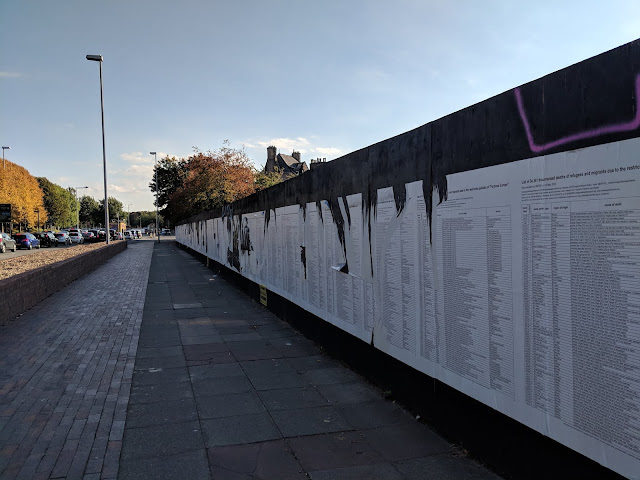 An updated edition of The List is presented on Great George Street in Liverpool and can be accessed online at guardian.co.uk. 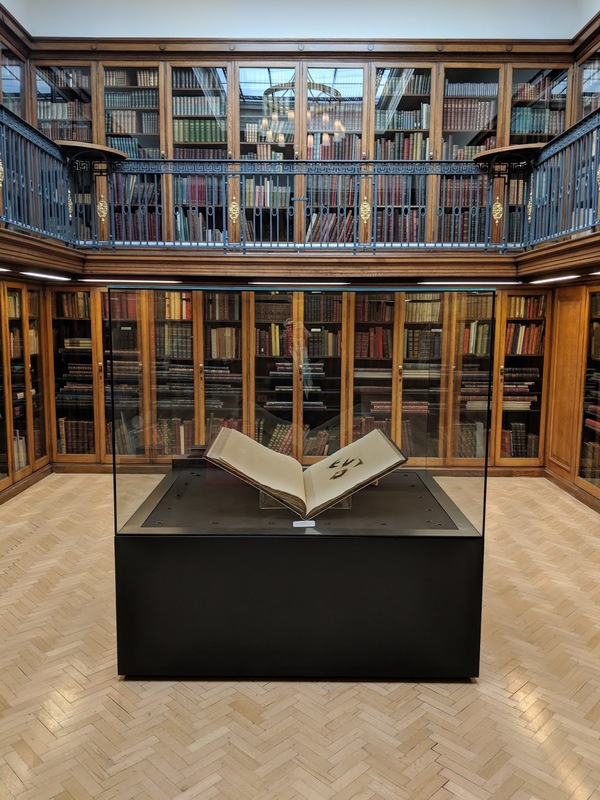 Copies of "The List", which were distributed by The Guardian newspaper on World Refugee Day on 20 June, are also available at exhibition venues. Installed on a 280-metre hoarding on Liverpool's Great George Street, "The List" has been vandalised twice since the biennial opened in July. 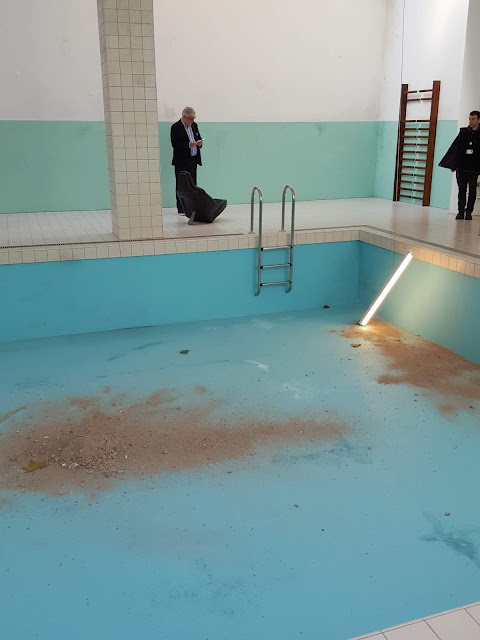 Cennetoğlu decided not to install it for a third time, leaving the ripped remains as a “reminder of the systematic violence exercised against people”. Mathias Poledna at The Oratory. 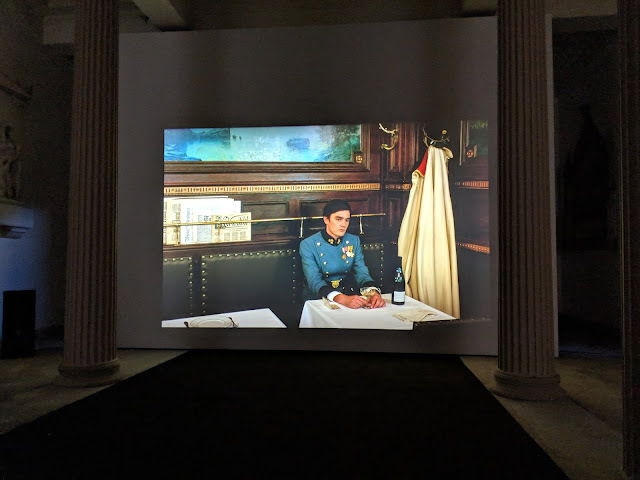 Screened within a specially designed structure, Mathias Poledna’s new film "Indifference" (2018) further advances his exploration of modernity’s visual imaginary. 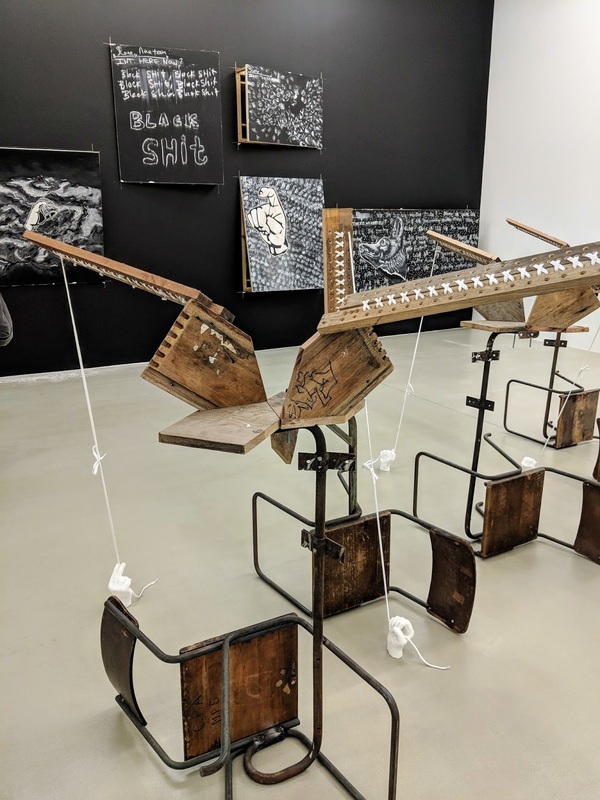 The work is set against the backdrop of early 20th-century European history, a period of traumatic modernisation and conflict. 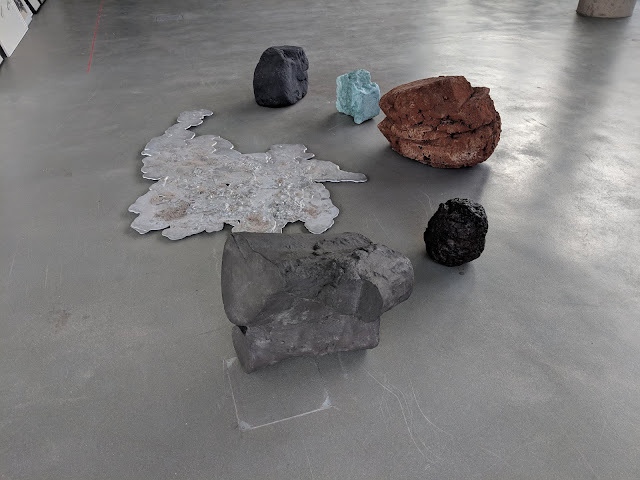 Suki Seokyeong Kang at Bluecoat. Conceived as a visual translation of the Korean musical notation ‘Jeongganbo’, Land Sand Strand is a new multi-part installation by Suki Seokyeong Kang. The work transforms the exhibition space into a grid. 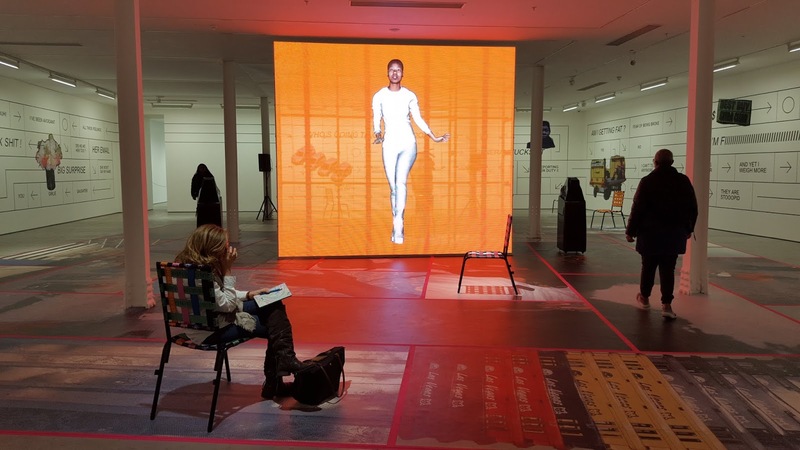 Building on the concept of the hwamunseok – a traditional Korean woven mat, interpreted as the minimum space provided for each individual in society – it is activated by performers and the audience. The choreography, inspired by the Spring Oriole Dance and traditionally performed on the hwamunseok, is shared with visitors. The movements on the mat serve as the blueprint for the wider installation consisting of painting, sculpture and video. 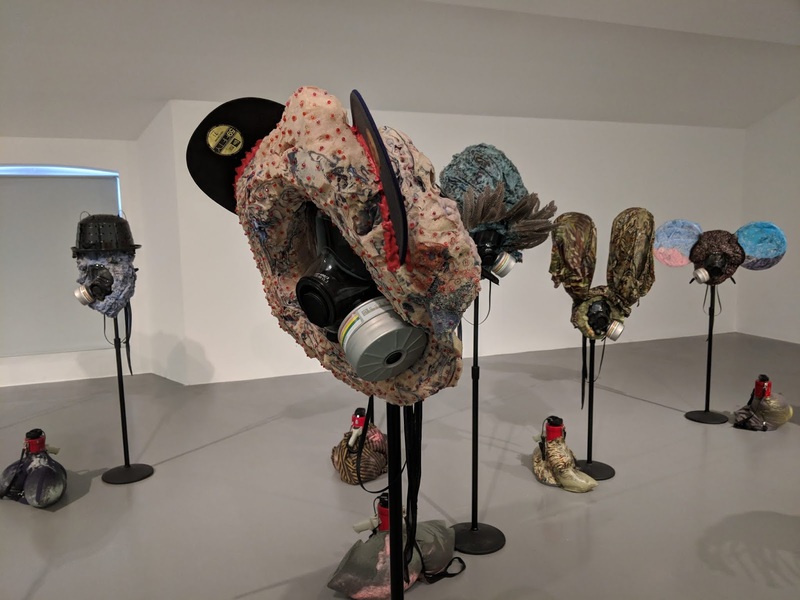 Brian Jungen at Tate Liverpool. Duane Linklater at Tate Liverpool. 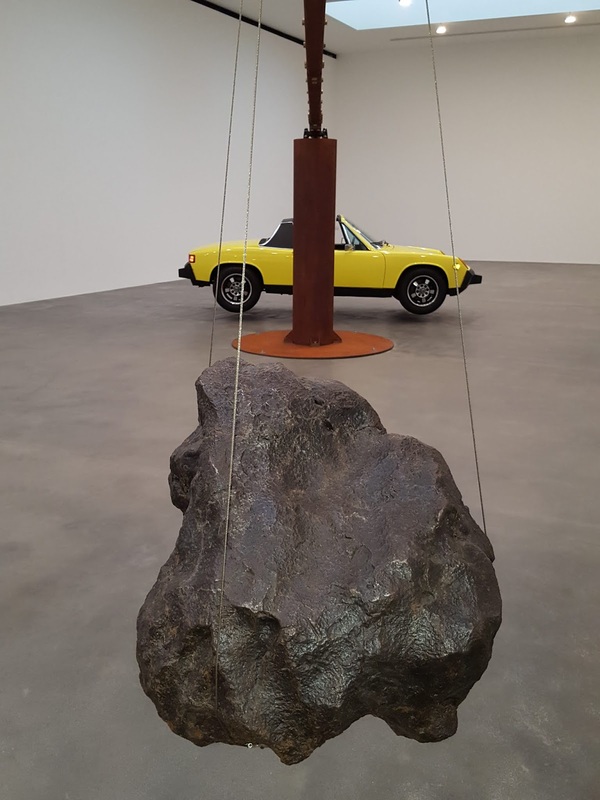 The sculptural works of Duane Linklater consider the notions of cultural loss, social amnesia and identity from the perspective of the indigenous peoples in Canada. 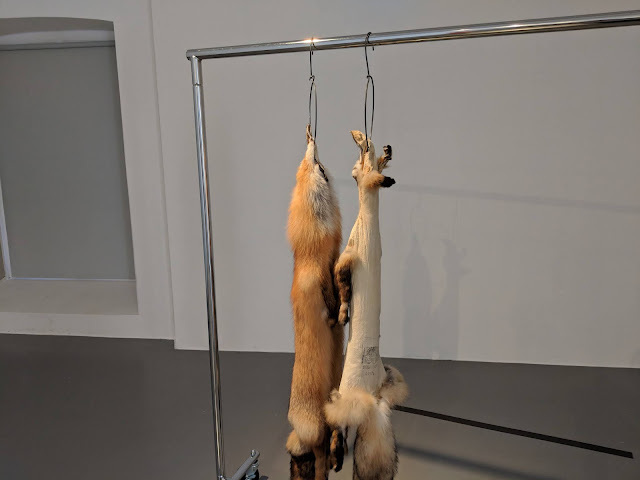 Commenting on the economy of the fur trade, they suggest that animals, even in death, might retain their spirits or selfhood beyond the value they possess as commodities. 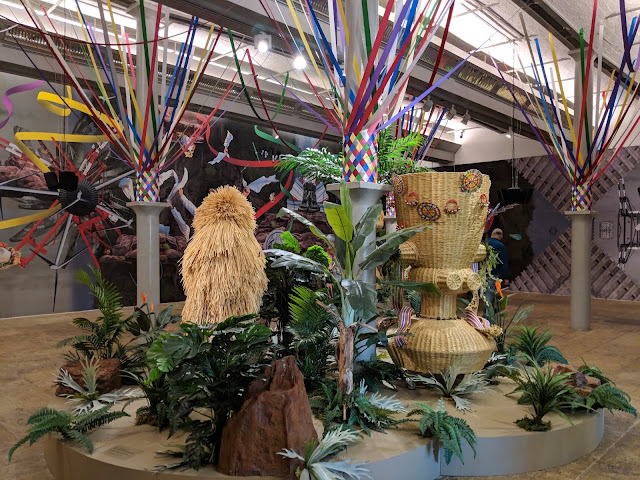 Haegue Yang at Tate Liverpool. 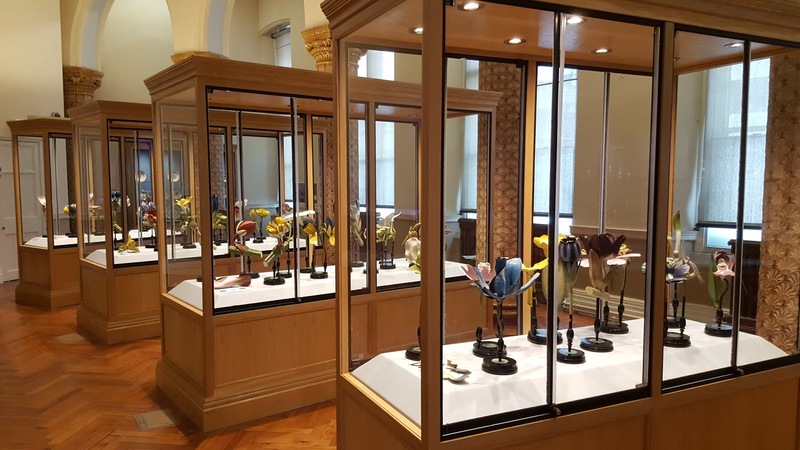 Haegue Yang presented her sculpture series "The Intermediates" (2015-ongoing) in Tate Liverpool's Wolfson Gallery. Made from artificial woven straw, The Intermediates allude to both traditional arts and crafts techniques and modern industrial production methods. Representing figures and sites from folk tales and ancient traditions, they question definitions of ‘paganism’. Yang’s environment for these works includes recordings of wildlife taken from the British Library’s sound collection, a wallpaper juxtaposing pagan traditions and modern history, and suspended ribbons that evoke folk traditions such as maypole dancing. 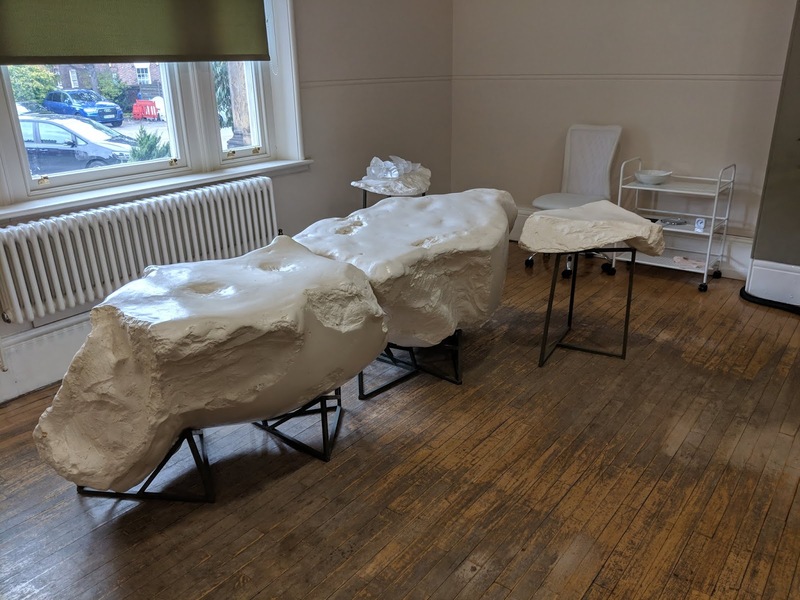 Her multisensory, hybrid environments suggest fleeting connotations of time, place, figures and experiences that connect ‘folk’ traditions and contemporary culture. Not as part of the biennial programming, but this conversation coincided with our visit. The White Pube's Zarina Muhammad and Gabrielle de la Puente were in conversation with Tate Liverpool's new director Helen Legg about their origins as "embodied art critics", their practice and the challenges art criticism presents today. Aslan Gaisumov at St George’s Hall. 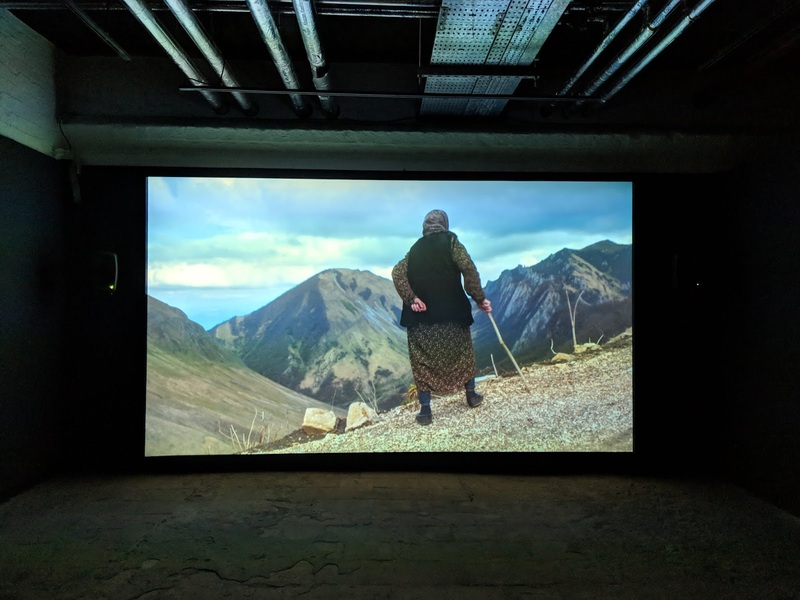 Tracing the struggles and turbulent histories of the Chechen people, Aslan Gaisumov’s most recent work Keicheyuhea (2017) follows the artist’s grandmother as she returns to her lost homeland in the mountainous scenery of the North Caucasus for the first time since the displacement of her family 73 years earlier. 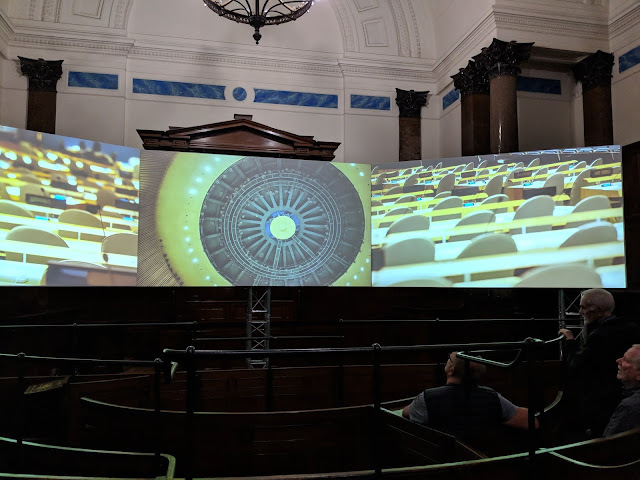 Naeem Mohaiemen at the St George’s Hall. Screened in the courtroom at St George’s Hall is "Two Meetings and a Funeral" (2017), a three-channel film by Naeem Mohaiemen – currently nominated for the Turner Prize 2018. The work revisits the Cold War-era power struggles between the political coalitions of the Non-Aligned Movement (NAM) and the Organization of Islamic Cooperation (OIC). 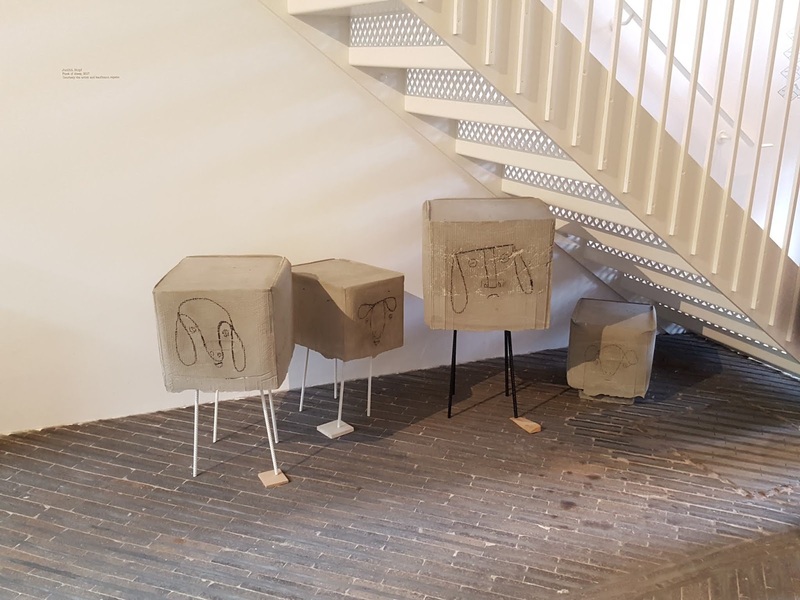 The project navigates alliances of convenience made during Bangladesh’s fight for UN recognition, as well as parallel decolonisation struggles in Palestine-Israel, the Portuguese colonies and South Africa. 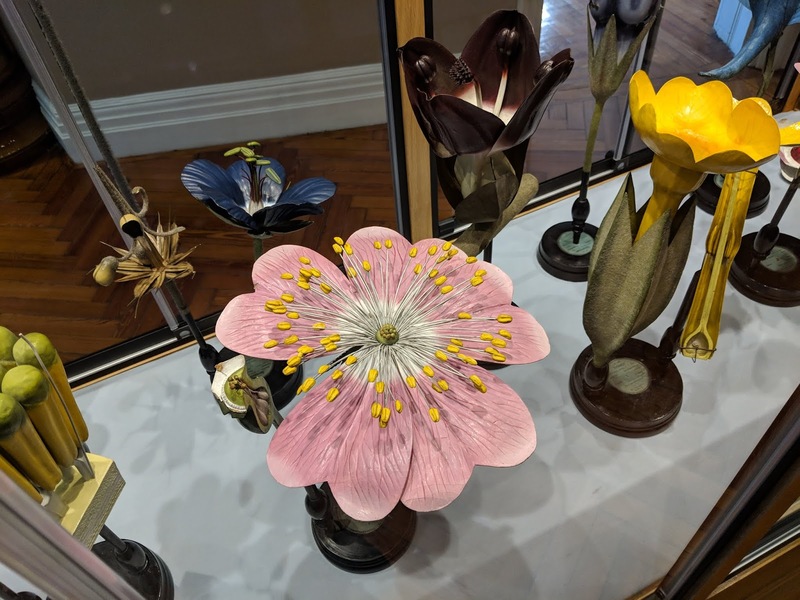 At the Victoria Gallery & Museum. 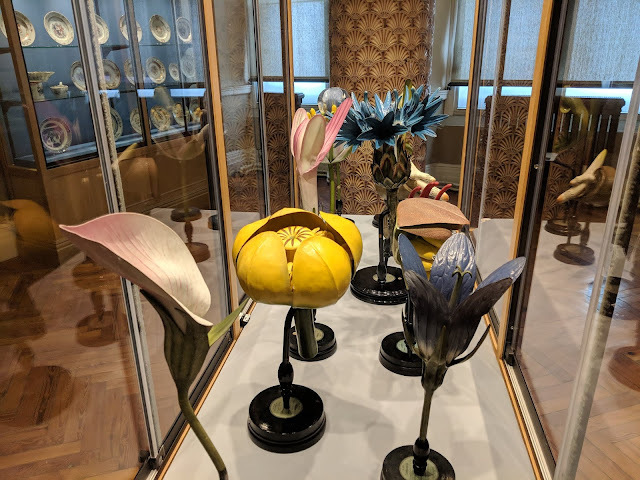 Part of "Worlds within worlds" section. Display of the Brendel Plant Models of World Museum anatomical models of plants, made for display and teaching purposes by the Berlin firm of R Brendel & Co in Germany around the turn of the 20th century. Francis Alÿs' paintings at the Victoria Gallery & Museum. 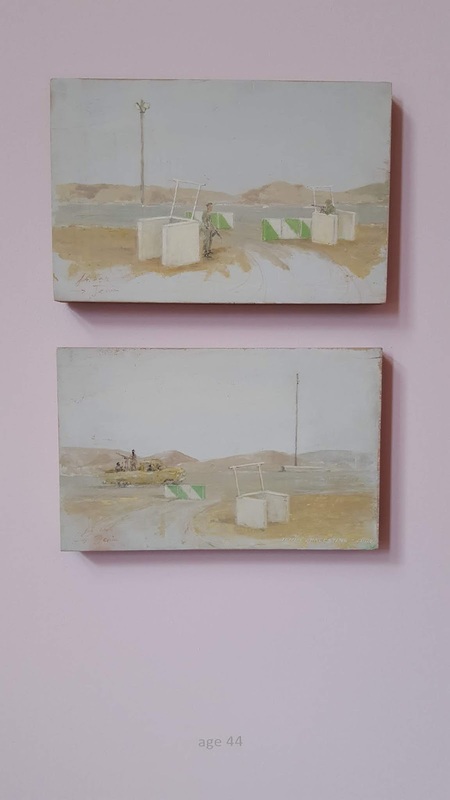 Francis Alÿs presents a selection of postcard-size paintings from the 1980s to today under the title Age Piece. Executed in the tradition of classic à plein air painting, these works allude to the condition of global tourism in the contemporary art scene. Many of the paintings were done while scouting new locations for future film projects, often in conflict zones such as Israel and Palestine, Afghanistan and Iraq. John James Audubon at the Central Library. One of the only 120 complete edition copies of The Birds of America by John James Audubon at the Central Library. The 19th-century book contains exquisite illustrations of a wide variety of birds of the United States. 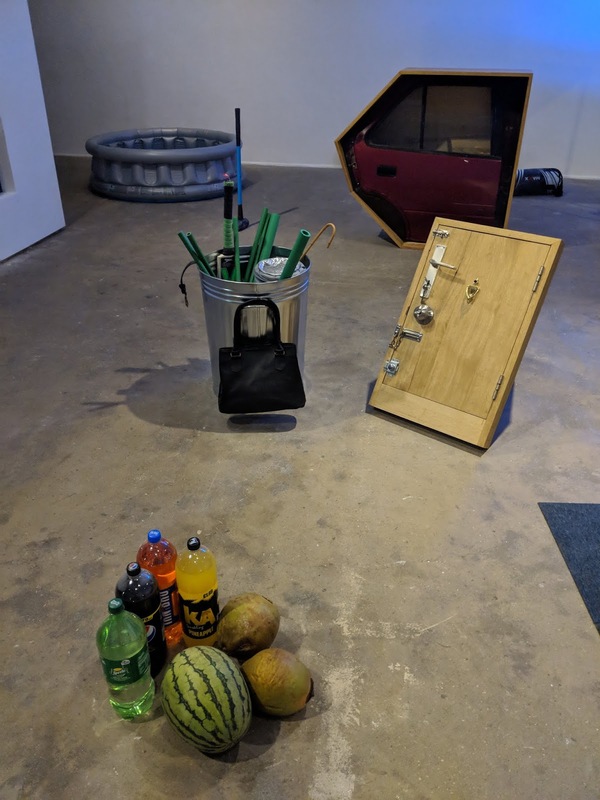 Paul Elliman's work at Exhibition Research Lab. Paul Elliman presents the "Vauxhall Astra 2020", the forthcoming and newest model of a car available since 1979 when General Motors launched the Vauxhall/Opel Astra, now the only car produced at Ellesmere Port. 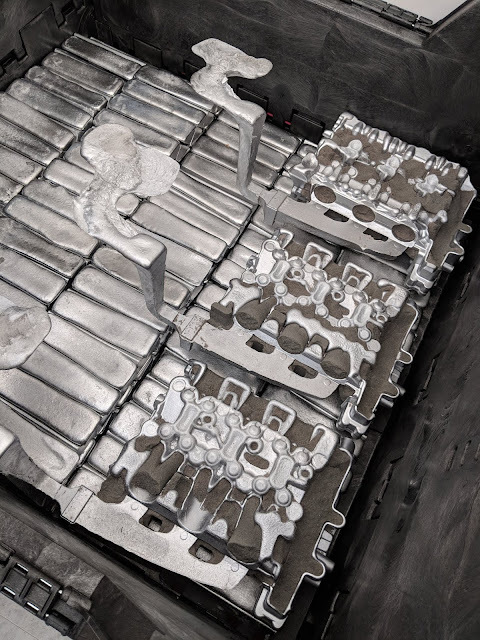 The Astra 2020 is offered as a constellation of raw materials, half-a-dozen boulders and rock-like lumps of the car’s constituent parts at original scale, made of steel (iron ore), glass, plastic, aluminum, rubber, and electrical components. 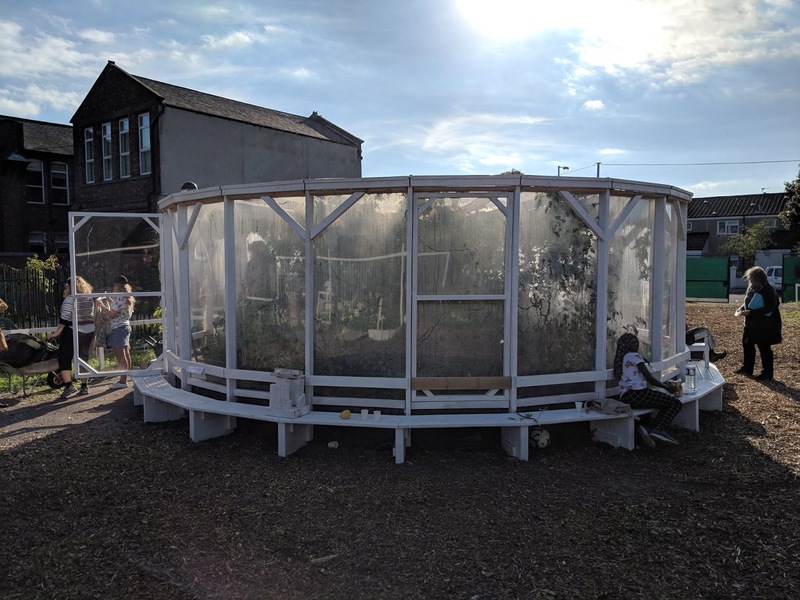 Above and below, Resilience Garden in Granby Street, Toxteth. 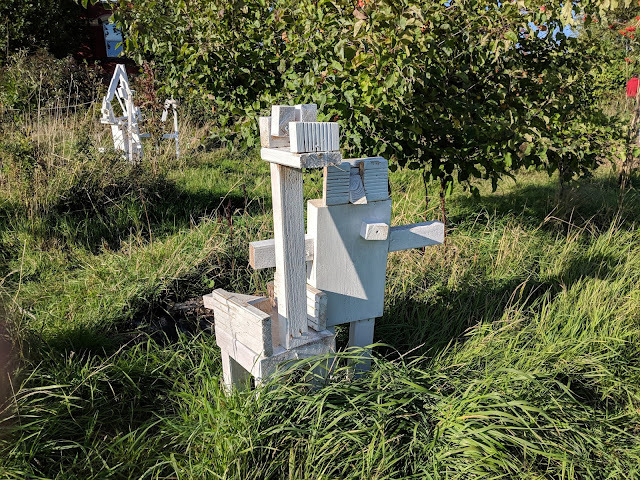 Mohamed Bourouissa has created a garden working with local people, gardeners, school pupils, teachers and artists. The artist was inspired by a garden made by a patient of the psychoanalyst and writer Frantz Fanon at the Blida-Joinville Psychiatric Hospital in Blida, Algeria. 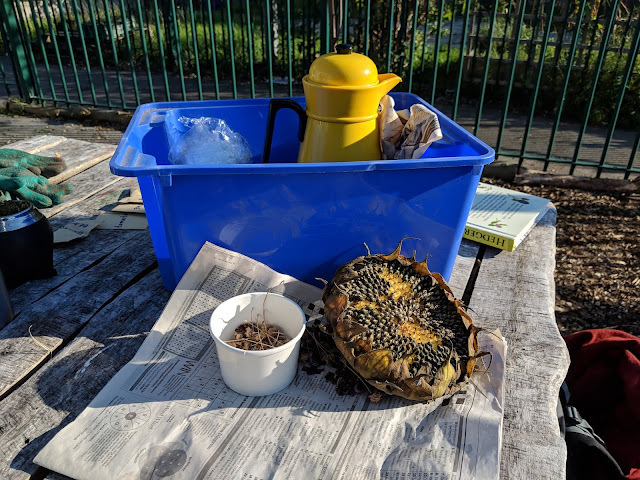 Fanon’s patient created the garden as occupational therapy, reflecting the organisation of his mental space through its structure. 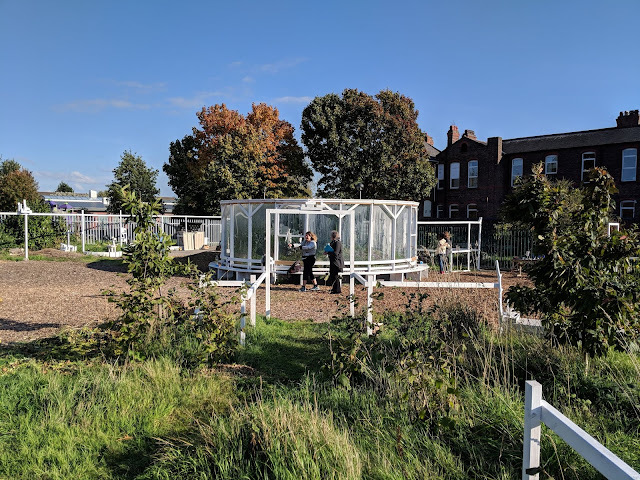 Bourouissa researched and learned the patient’s approach to botany, architecture, and therapy in order to create a similar garden in Liverpool. The garden has been conceived as a space of ‘resilience’. 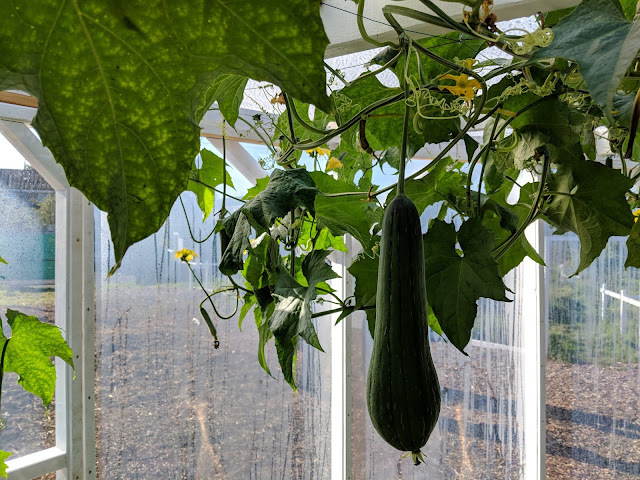 Some of the plants are native to Algeria and others have healing effects. 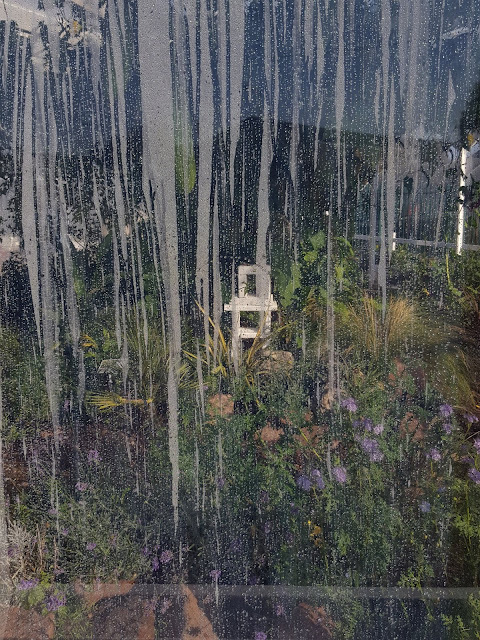 A film documenting the garden and its evolution is presented at FACT. Very close to Bourouissa's Resilience Garden is Assemble's ongoing project at Granby's Street. 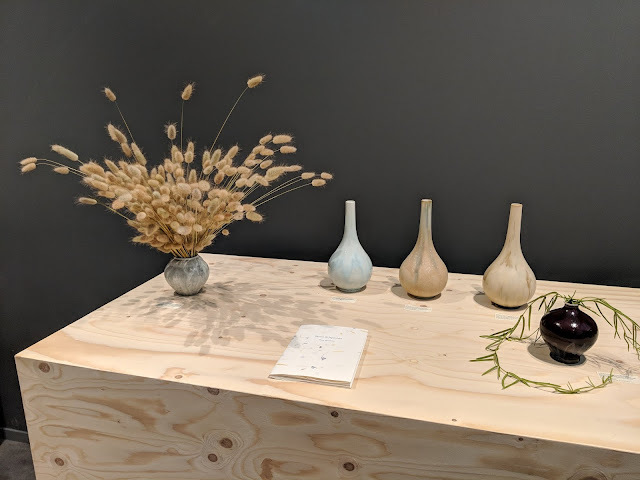 Assemble's ceramic workshop in Granby Street, "a manufacturer of architectural ceramics, based in Liverpool and established in 2015. The workshop is part of Assemble's ongoing involvement with the Granby Four Streets neighbourhood." Work by Taus Makhacheva at Blackburne House. 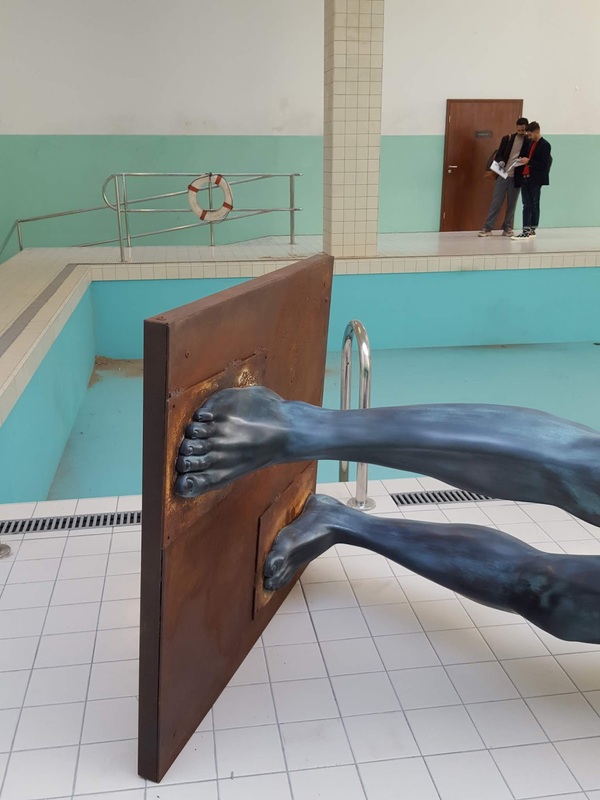 Taus Makhacheva has created a ruin-like sculptural installation that serves as a spa, in collaboration with artist Alexander Kutovoi. The installation incorporates ASMR (Autonomous Sensory Meridian Response) techniques and video. Advertising in Pimlico. Above and below photos by Latitudes. 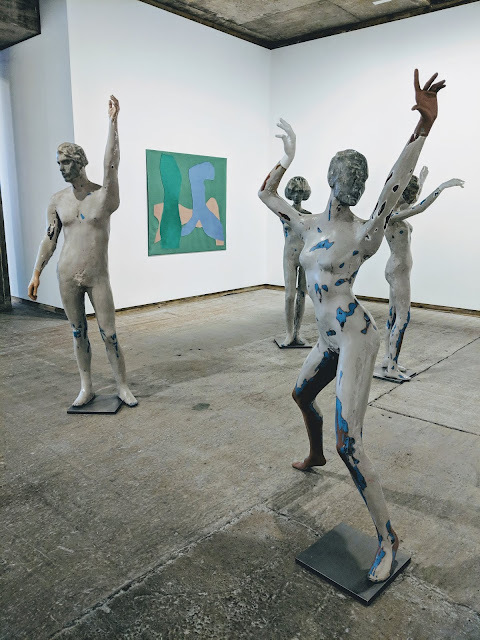 Just as Frieze Art Fair opened last Wednesday, Prime Minister Theresa May gave her keynote speech—and dared to dance again—at the Conservative Party Conference in Birmingham. She announced that freedom of movement would be terminated “once and for all” by limiting access to “highly skilled workers” (in short, migrants earning over 30,000 British pounds per year). 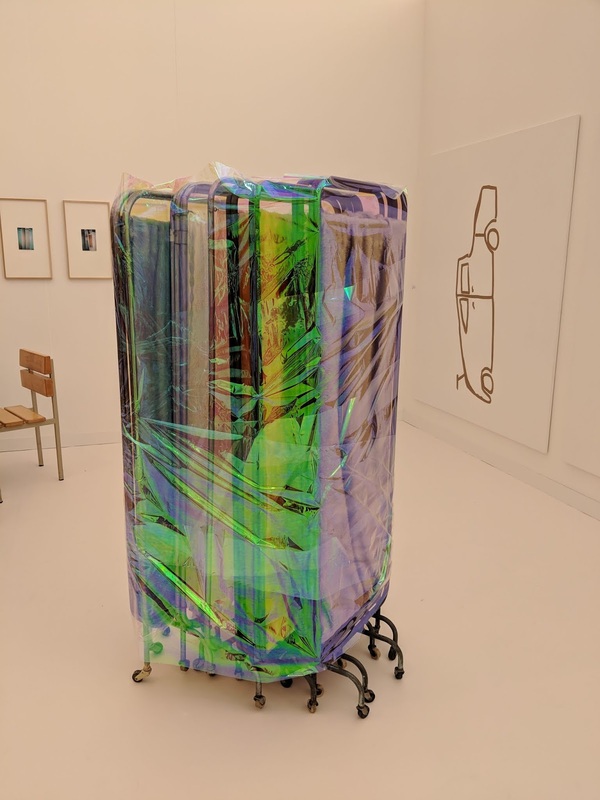 Countless art professionals earn much less (including entry-level curatorial staff at Tate, and yours truly), as well as doubtless many of the myriad gallery and museum folks involved in the city-wide jamboree of Frieze week. 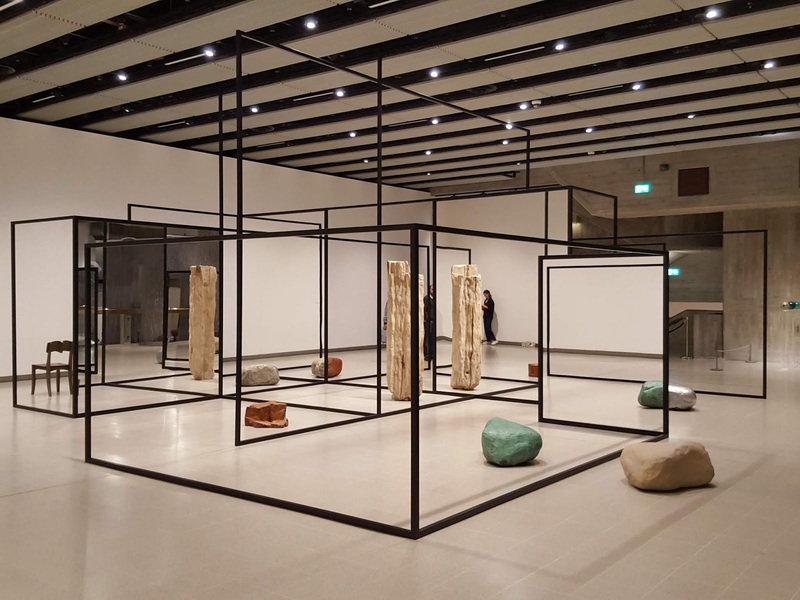 How do we imagine London’s contemporary art ecology post-Brexit, a scene that has grown exponentially since Tate Modern’s opening in 2000 and the first Frieze Art Fair in 2003? The question of how the 2019 edition of the fair is going to be affected was the elephant in the tent. Most people I asked shrugged: negotiations are still ongoing, consequences are yet to be seen. “It’ll be fiiiiine,” a London museum director told me. “Maybe we’ll visit a smaller fair, like the first editions—remember those days?” opined a British gallerist friend working in New York. 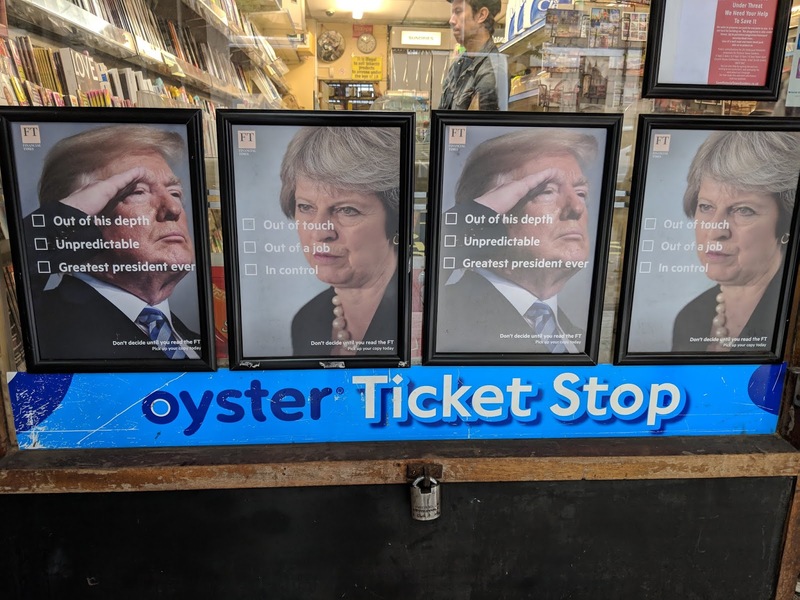 Although one could put this upbeat denial down to the cliché of dark British humor and the spirit of “muddling through,” I nevertheless left worried that something more troubling lay behind it. 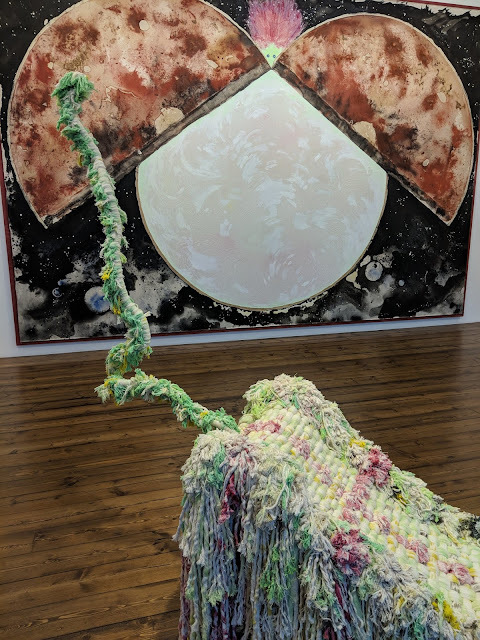 If Frieze might have triggered the relocation of many contemporary art galleries from the East to the West of the city, two recent institutional openings are enforcing a southern axis. 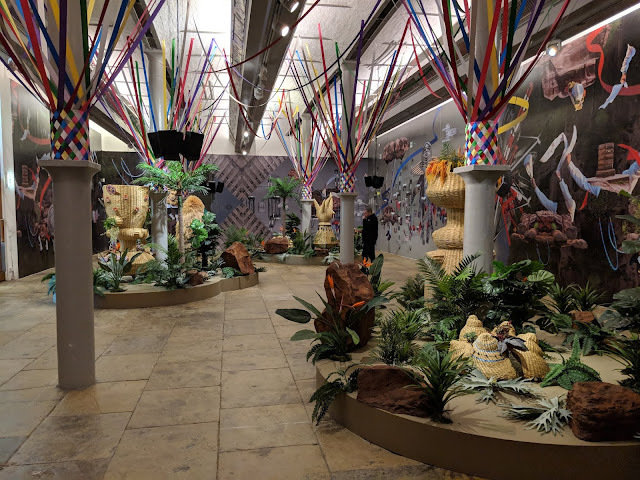 The new Goldsmiths Centre for Contemporary Art in New Cross, housed in a listed Victorian bathhouse refurbished by 2015 Turner Prize winners Assemble, kicked off with a sparkling survey show of Mika Rottenberg’s absurdist film installations offering grotesque parodies of current labor conditions. 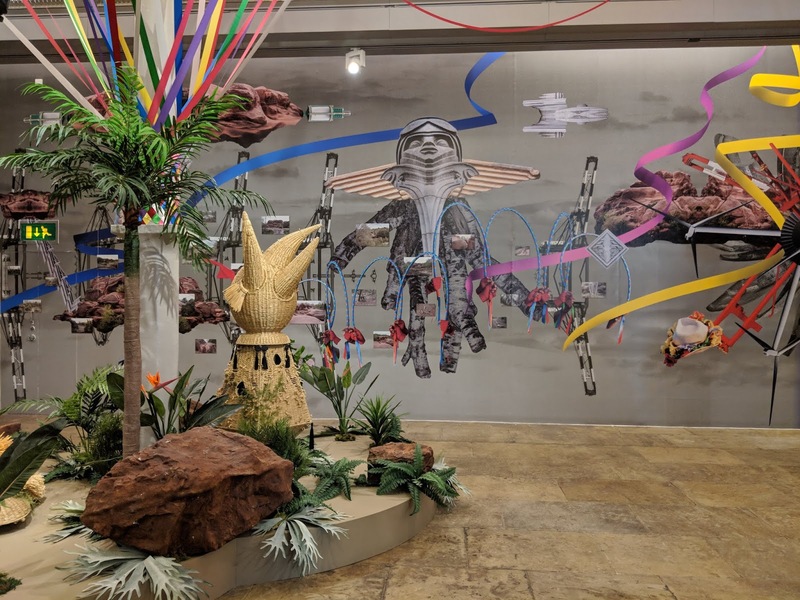 The second home of the South London Gallery at Peckham Road Fire Station, elegantly renovated by 6a architects, opened with “Knock Knock,” a group show about the uses of humor—from political satire to visual puns—in contemporary art. 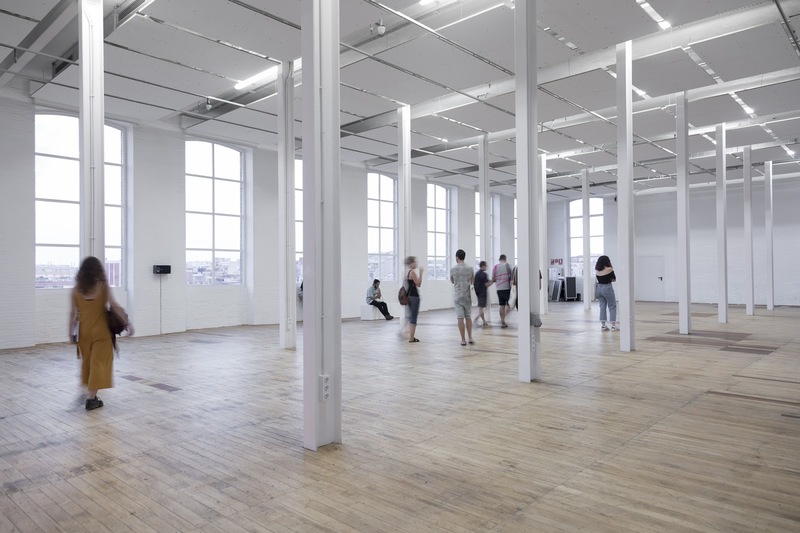 The addition of these spaces will surely benefit Gasworks, a short bus ride away in nearby Vauxhall, whose truly international program of residencies and exhibitions over the last two decades has been a vital antidote to the dangers of isolationism in the British art scene. 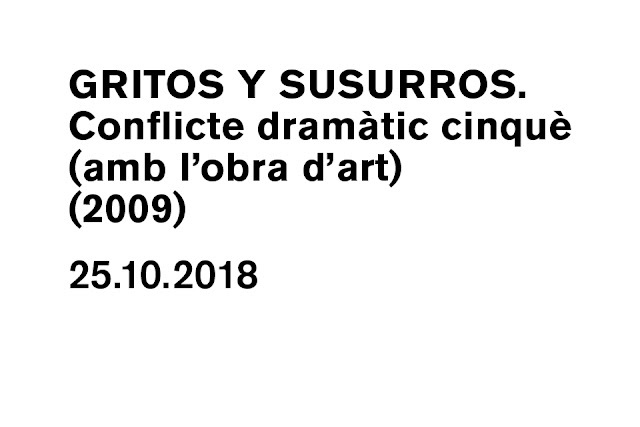 Text originally published in Art-agenda on October 12, 2018. 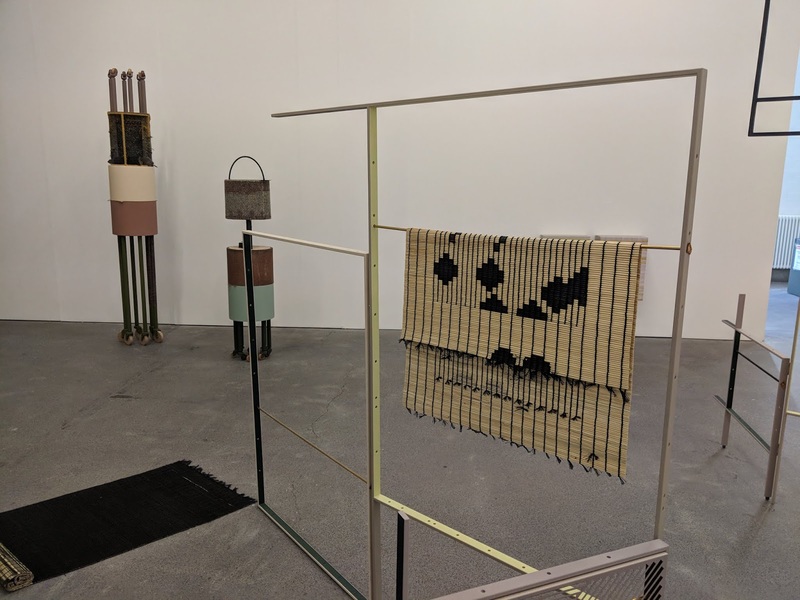 Lucy Dodd at Sprüth Magers, London. 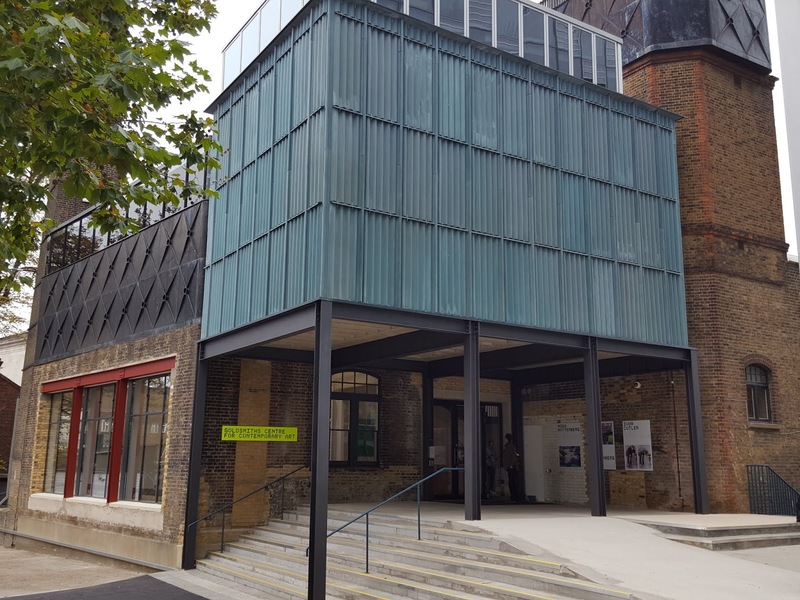 Façade of the new Goldsmiths Centre for Contemporary Art in New Cross. 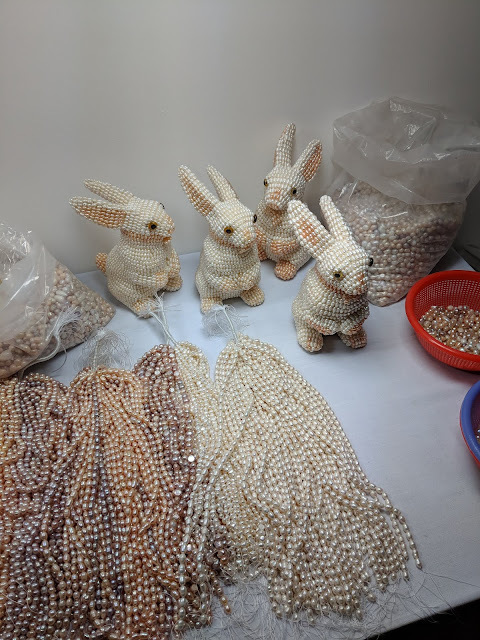 Detail of Mika Rottenberg's show at Goldsmiths Centre for Contemporary Art in New Cross. 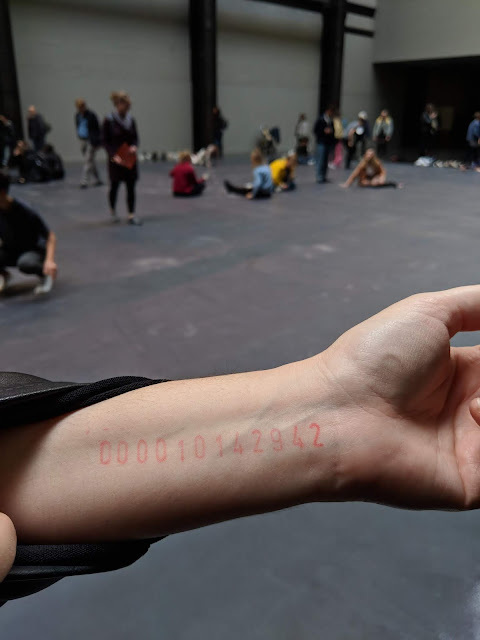 Part of Tania Bruguera’s 2018 Hyundai Commission at Tate Modern. 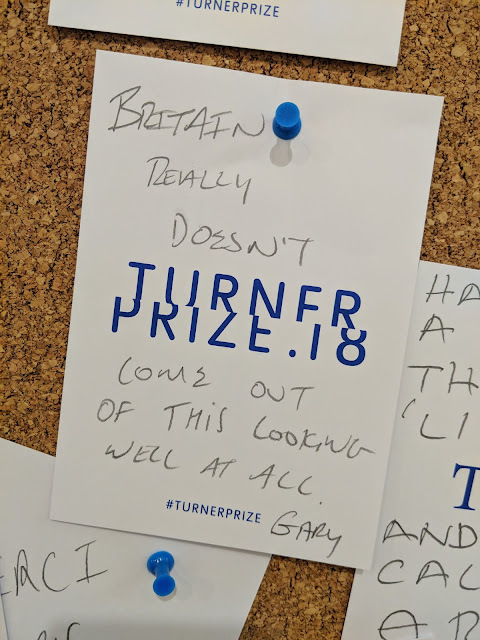 Visitor's comments on the Turner Prize 2018 board. 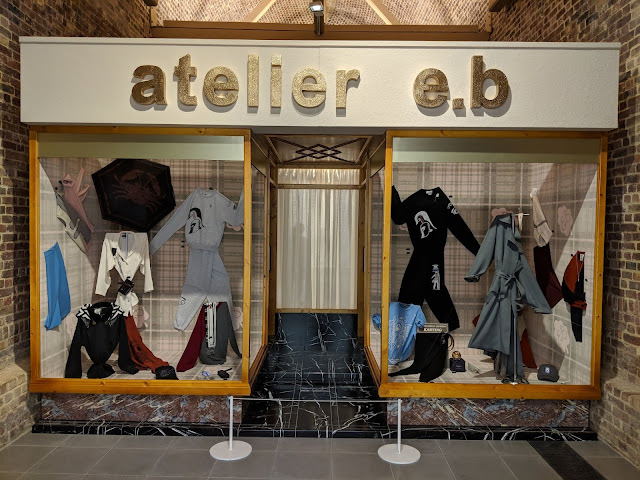 Installation from Atelier E.B's show at the Serpentine Sackler Galleries, London. Detail from Cayetano Ferrer's solo exhibition “Demaster” at Southard Reid, London. Martine Syms at Sadie Coles HQ, London. Judith Kopf's "Flock of Sheep" (2017) at the South London Gallery. 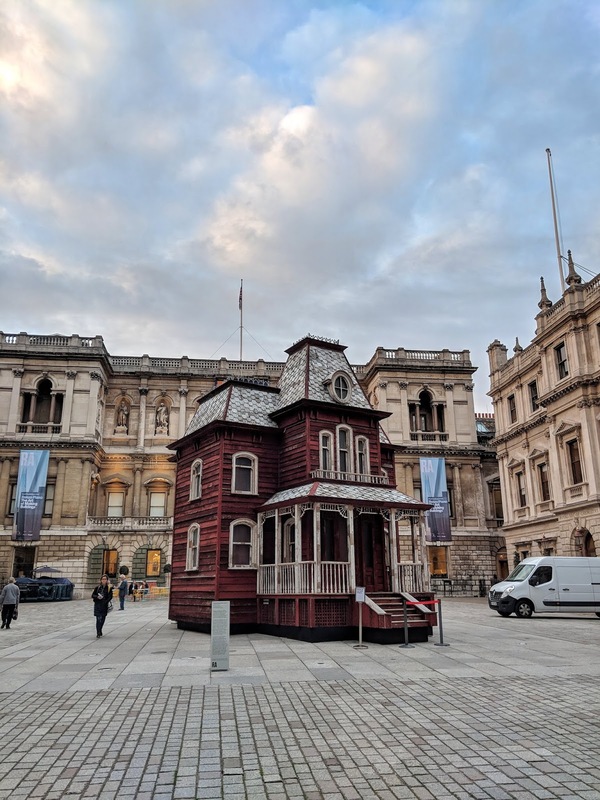 Cornelia Parker Transitional "Object" (PsychoBarn) at the Royal Academy. Johanna Unzueta at Proyectos Ultravioleta, Focus section, Frieze Art Fair. 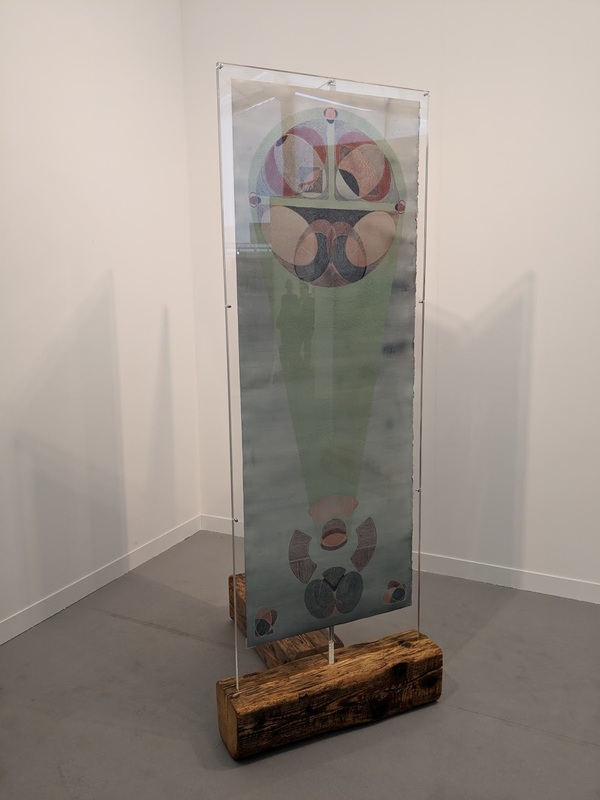 (Above + below) Sam Lewitt, "Core (the "Work")", BMW Open Work commission, Frieze Art Fair. Ian Law at RODEO, Frieze Art Fair. 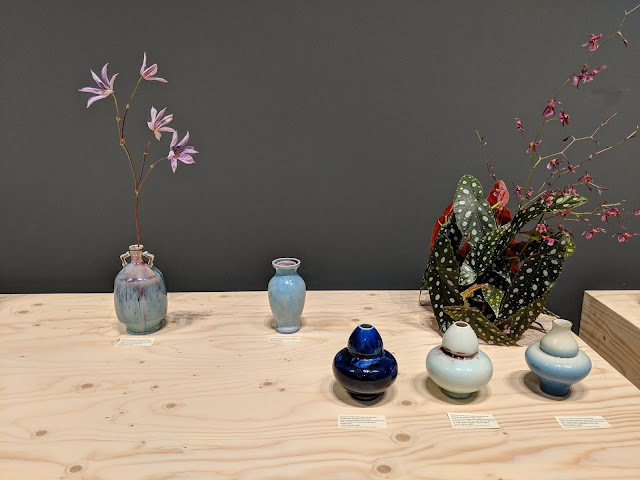 (Above and below) Oscar Humphries' "Sèvres and Japonism" at Frieze Masters, London. 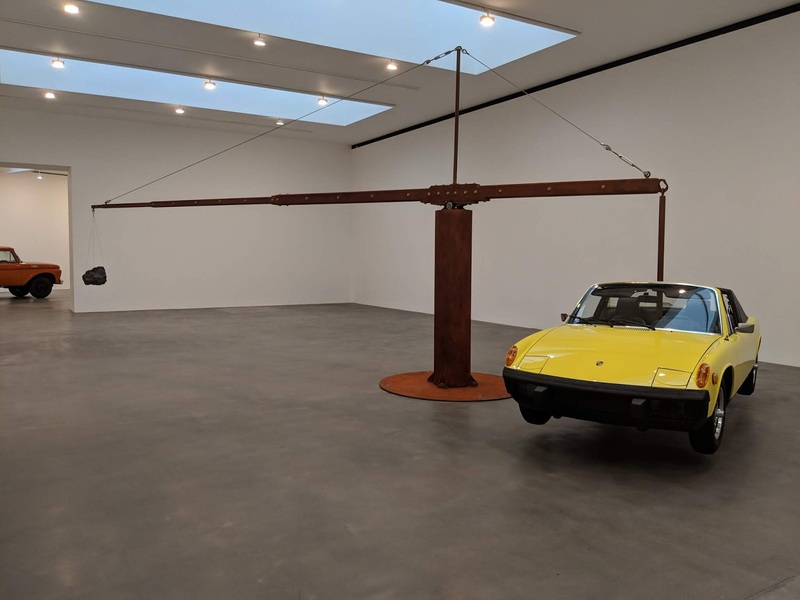 (Above and below) Chris Burden at Gagosian, London. Lawrence Abu Hamdan at Chisenhale, London. 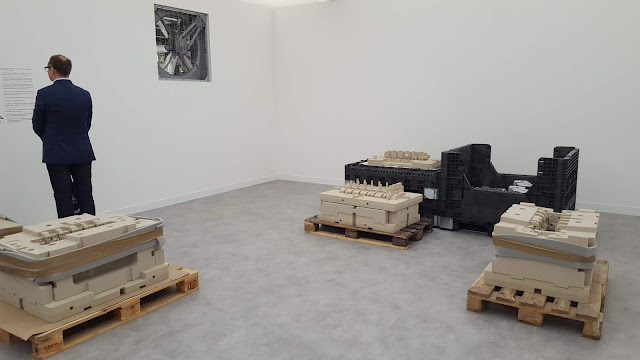 Daniel Silver at Frith Street Gallery, London. 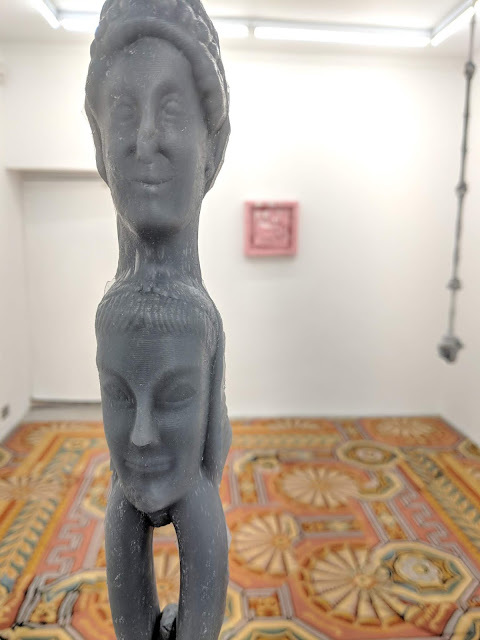 Kemang Wa Lahulere at Marian Goodman Gallery, London. 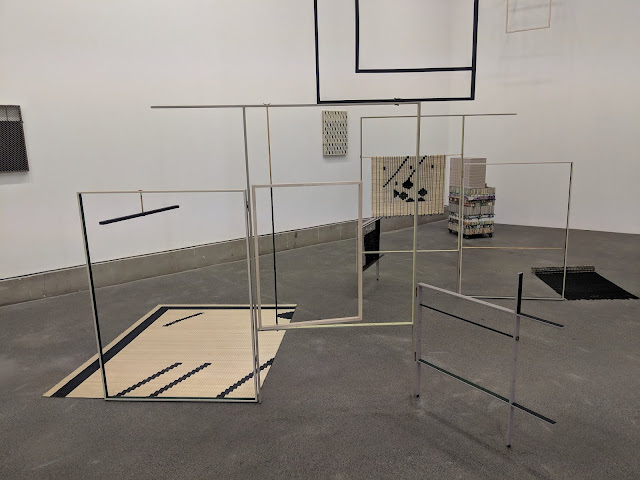 Alicja Kwade's work in the "Space Shifters" exhibition, Hayward Gallery, London. (Above and below) Elmgreen and Dragset, "This is how we bite our tongue", Whitechapel, London. 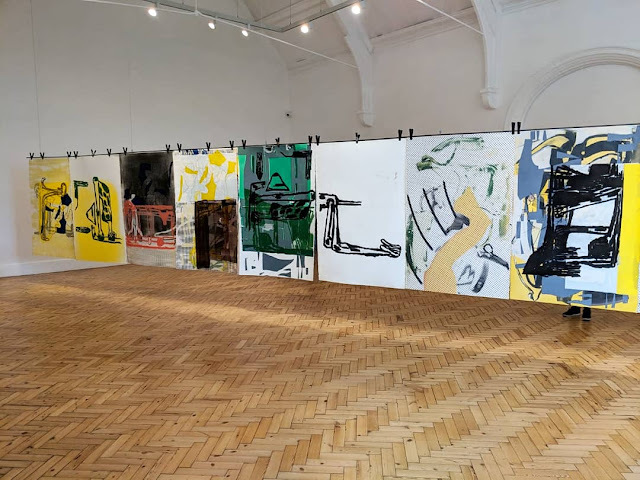 Amy Sillman at Camden Art Center, London. art-agenda review of Jennifer Allora & Guillermo Calzadilla exhibition at the Fundació Antoni Tàpies, by Mariana Cánepa Luna, 12 October 2018.